Product Range : SE1022 Series. SWITCH SLIDE DPDT. Switch Mounting : Panel. Switch Operation : -. Actuator Type : Vertical Flush. Actuation Type : Flat. SVHC : No SVHC (17-Dec-2015). You are purchasing part number 25136NAH6 Manufactured by APEM. SLIDE SWITCH SPDT TOP BUTTON. Actuator Type : Flush Slide. Switch Mounting : Through Hole. Switch Operation : On-On. External Depth : 8mm. You are purchasing part number 25336NA Manufactured by APEM. SLIDE SWITCH SPDT SIDE BUTTON. Actuator Type : Flush Slide. Switch Operation : On-On. Switch Mounting : Through Hole. External Depth : 10mm. Product Range : ASF Series. Switch Mounting : SMD. of Electrical Operations : 10000. SLIDE SWITCH. Actuator Type : Flush Slide. Switch Operation : -. You are purchasing part number ASF22GL Manufactured by TE CONNECTIVITY. 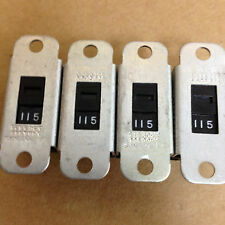 20 PIECES 8-1437581-6 TYCO ALCOSWITCH. FLUSH SLIDE SWITCH. 2 POSITION. ROHS 1 TUBE. 20VAC 20VDC. 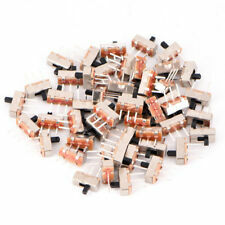 Also a great component for DIY. Switch Total Size : 8 x 4 x 10mm/ 0.31" x 0.16" x 0.39"(L W H);Knob Size : 1.5 x 1.5 x 3mm/ 0.06" x 0.06" x 0.12"(L W H);. 5 PCS x C&K SD04H0SK . There are 10 of these Switchcraft NOS switches.